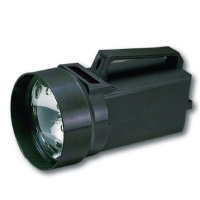 Categories: Hand-held Tester, Lutron, Others. *When LUTRON meters ( max. 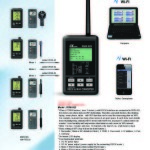 3 meters ) with RS232 interface are connected to RSW-923, the meters can share data via WiFi technology. 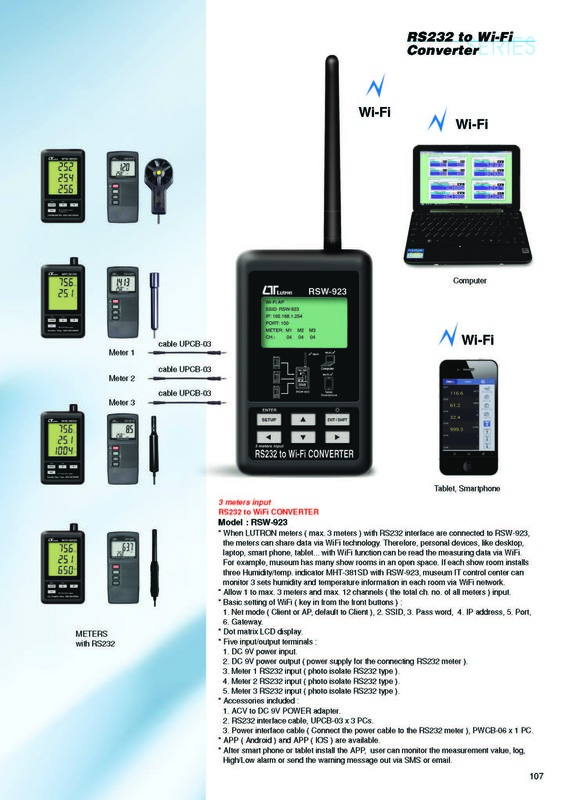 Therefore, personal devices, like desktop, laptop, smart phone, tablet… with WiFi function can be read the measuring data via WiFi. For example, museum has many show rooms in an open space. If each show room installs three Humidity/temp. indicator MHT-381SD with RSW-923, museum IT control center can monitor 3 sets humidity and temperature information in each room via WiFi network. *Allow 1 to max. 3 meters and max. 12 channels ( the total ch. no. of all meters ) input. 2.DC 9V power output ( power supply for the connecting RS232 meter ). 3.Meter 1 RS232 input ( photo isolate RS232 type ). 4.Meter 2 RS232 input ( photo isolate RS232 type ). 5.Meter 3 RS232 input ( photo isolate RS232 type ). 1.ACV to DC 9V POWER adapter. 2.RS232 interface cable, UPCB-03 x 3 PCs. 3.Power interface cable ( Connect the power cable to the RS232 meter ), PWCB-06 x 1 PC. *APP ( Android ) and APP ( IOS ) are available. *After smart phone or tablet install the APP, user can monitor the measurement value, log, High/Low alarm or send the warning message out via SMS or email. 1.CH No : Channel number from 1 to 12. 4.Port No : Fill your WiFi converter port number, for example 100, 101…etc. button to save the data above as default value. *When LUTRON meter with RS232 interface and WiFi converter ( RSW-923, RSW-914, ) are connected together, the meter can share data via WiFi technology. 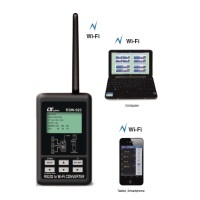 Therefore personal devices, like smart phone or tablet with MeterAPP installed, can read the measuring data via WiFi and also make further data analysis. *MeterAPP can load maximum 16 meters. ( 4 meters for 4 projects ). *Each meter can display maximum 12 channels. *Sampling time can be set from 1 to 60 minutes. *Each channel can preset high/low threshold for alert. 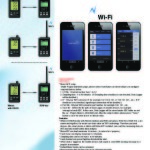 *When alert is triggered, the mobile devices will sound or send SMS warning message to 3 peoples in maximum. *Default Meter name can be renamed. 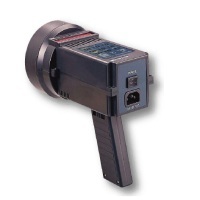 *Measurement data display unit can be changed manually. *Data Logger has 2 modes: ” Auto Log ” or ” Manual Log “. 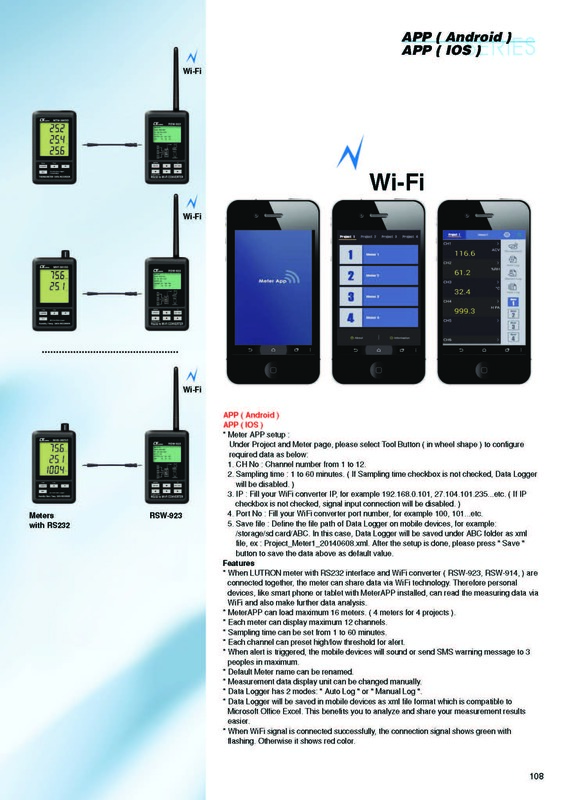 *Data Logger will be saved in mobile devices as xml file format which is compatible to Microsoft Office Excel. This benefits you to analyze and share your measurement results easier. *When WiFi signal is connected successfully, the connection signal shows green with flashing. Otherwise it shows red color.